Greetings to everyone and welcome to a new fishing season! This will be another amazing year of memories, incredible catches and time spent with clients, family and friends on the river. We are proud to say we are now in our 29th season since I started this journey back in 1988 and its hard to believe where we have come. One boat, one guide and at a time when only 4 guides on the entire Chilliwack area of the Fraser River. 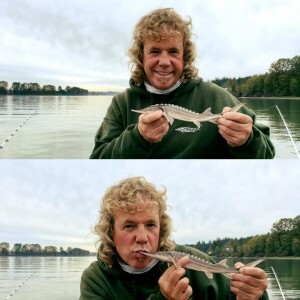 The fisheries have changed so much over the years and if you were to ask me at the beginning of our journey if we would be so focused on Sturgeon fishing over Salmon fishing, I would have likely told you that you had rocks in your head. But this shows you that our business continues to evolve each year and we adapt to whatever the clients are interested in the most. 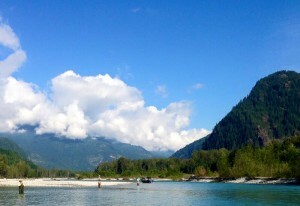 Notwithstanding the Salmon fishery stays dear to our hearts and is our grass roots, but it is our unique fishing experiences like the Pitt River and the Lillooet River Wilderness Camp that our clients are coming from all over to experience. These fisheries are still very under utilized and are far enough away that we have the solitude to give fly fishing experiences like few others can compete with. We continue to lead the way with our team of single and double hand fly casters. 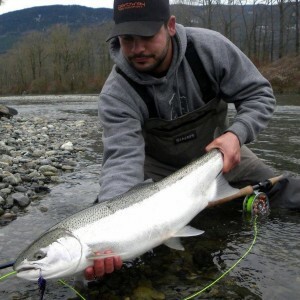 We can boast that we have the best fly-fishing expert guides in this industry today. This brings Salmon and Trout clients back year after year from all corners of the globe. have good catches and the fish will start to move around a little more as the river begins to freshet. 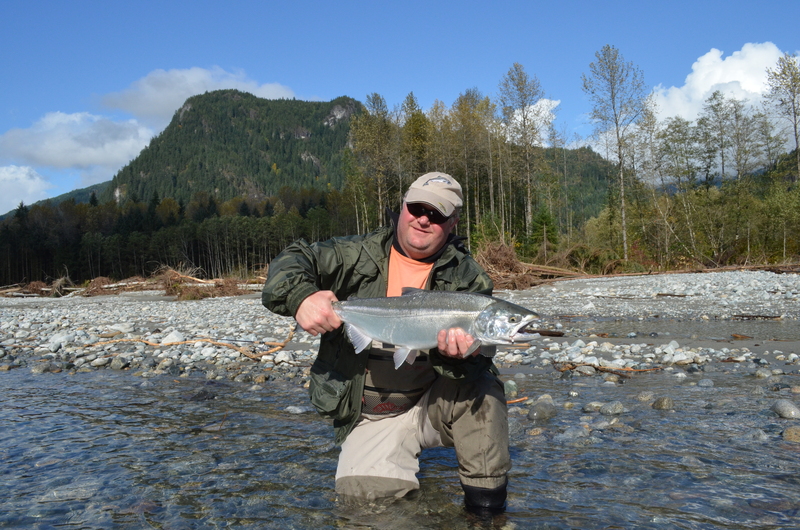 In early April the first sign of Eulachon migrate up the Fraser River which spurs these fish onto a feeding frenzy. If the water stays on a slow increase in height the fishing remains very good and the fish are aggressive. The more the water temperature goes up the harder fighting and more acrobatic these fish become. Early April with the water rising also gives us our first chance to go to the Fraser Canyon. This is a fishing experience that lets you feel as if you have gone back in time, when these fossil fish roamed the rivers alone. The glacier carved Fraser Canyon holds deep First Nations history and culture and one of the most challenging river areas to fish on the entire Fraser River. It can also hold the keys to some of the best Sturgeon Fishing. We have only 3 guides trained for this part of the river and we book Fraser Canyon Adventures only from May until the end of September each year, so space can be limited. 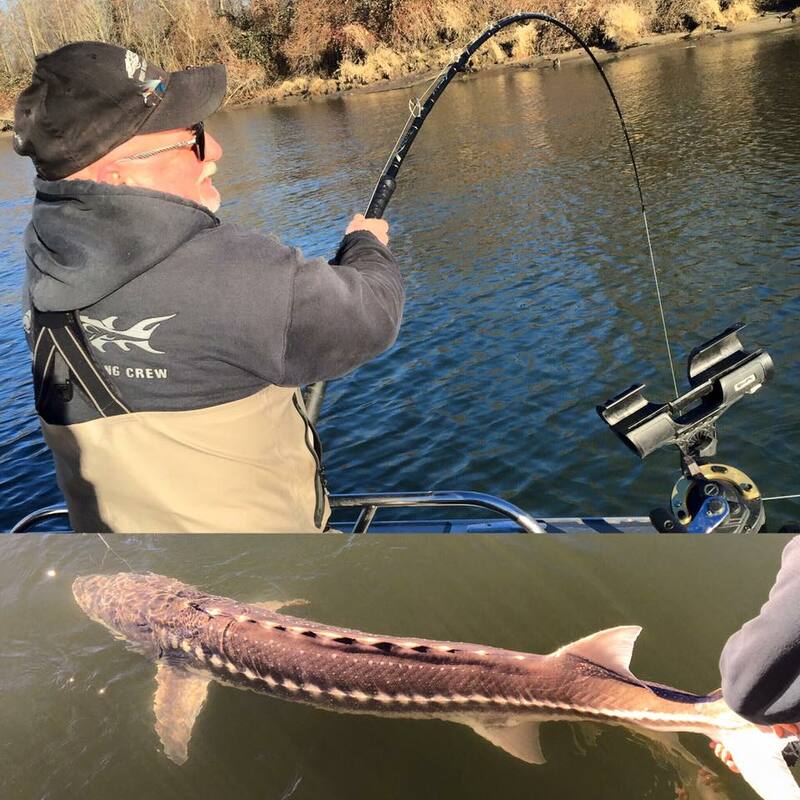 We expect the Sturgeon fishery to be very strong again in the 2016 season and look forward to the many great trips and happy clients. Another thing that stays on the forefront of our thoughts is how we have continued to be dedicated to the Sturgeon mark recapture program. This is the 22 years of tagging for our company, collectively we have helped to tag 65,000 unique Sturgeon and we have scanned upwards of 150,000. We are proud of this accomplishment and to be part of this on every adventure. We get new fishers everyday marvel at the research and like to be part of this program on our boats with our trained guides. 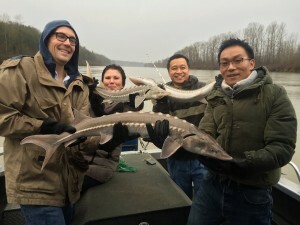 If you are shopping around for a Sturgeon Experience, be sure to ask the important questions like – do you tag for conservation? A full well rounded experience on the water is what our clients enjoy each and every trip. hook up or two and the things you can learn on a 4 hour to 8 hours trip yields you the ability to chase these fish with confidence for the future. Moving on to April we are once again offering our Lillooet River fly fishing camp, this is only offered for 21 days each year and is our wilderness river that few ever get to fish. There are a few spaces left for the 2016 season and we offer a 3 day / 3 night options or 6 day / 6 night. 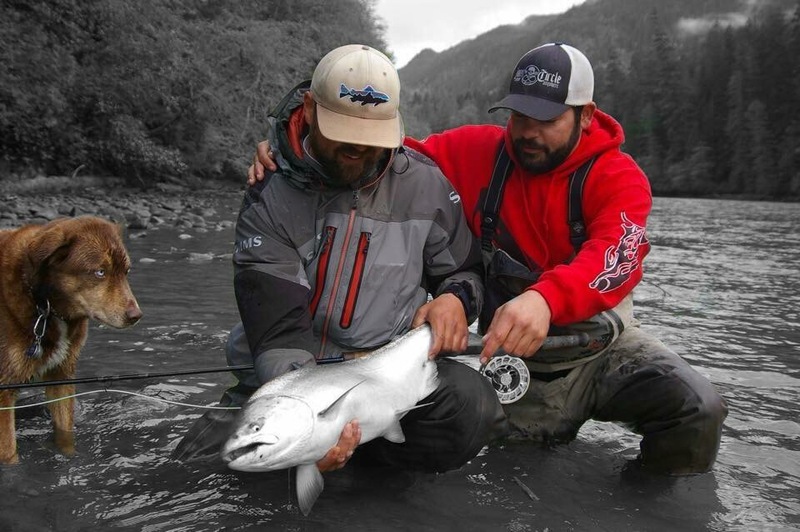 This fishery holds all wild fish species, Rainbow, Cutthroat, Westslope Trout, Dolly Varden, Bull Trout, Steelhead and even some Chinook Salmon. Our team of guides will ensure that this experience is unlike any other. Fishing a pristine river like this with little pressure on the fish stocks is a once in a lifetime opportunity. If you are interested please contact us by email at info@greatriverfishing.com for the 2016 or 2017. The next great fishing opportunity for 2016 is the Upper Pitt River and this comes into great shape mid May and lasts until mid August. Some of the most incredible scenery and fishing is what this river is about. Again we have only 3 guides trained for this river as it is so complex that it requires years of experience and patience when driving the glacier fed river. Fly fishing here yields some of the only sea run Dolly Varden and Bull Trout in the world and these fish can reach up to 14 lbs. A great place to learn double hand casting or tune your single handing. This river also boasts one of the largest strains of Sockeye in the world and has good runs of Chinook Salmon as well. This has to be on every fly fishers list! The Salmon fishing for the 2016 season should be another strong one, we are hoping to see the Fraser River open for Chinook fishing in early July but this will be based on in river stock composition done by DFO in June. The main fishery will get under way in August and we will have to see what the number for Sockeye will be and are strong enough for a recreational fishery, but one never knows what the river will yield. Chinook will be the target fish and for most this is the great to catch with sizes reaching over 60 lbs. We have no Pink Salmon this season, so September will be slower but we do have the South Thompson Chinook at peak migration and that stock should be very strong. This leads us to the Chum which arrive in early September but ramp up in numbers usually by the beginning of October. October is the big month of the year, with 4 species of Salmon being present, main focus for most is Chum, Coho and Chinook and the fishery lasts well into mid November. We see the fall numbers increasing most years and this looks like another great year to come fishing for our clients. In closing a few things to note on your calendars. 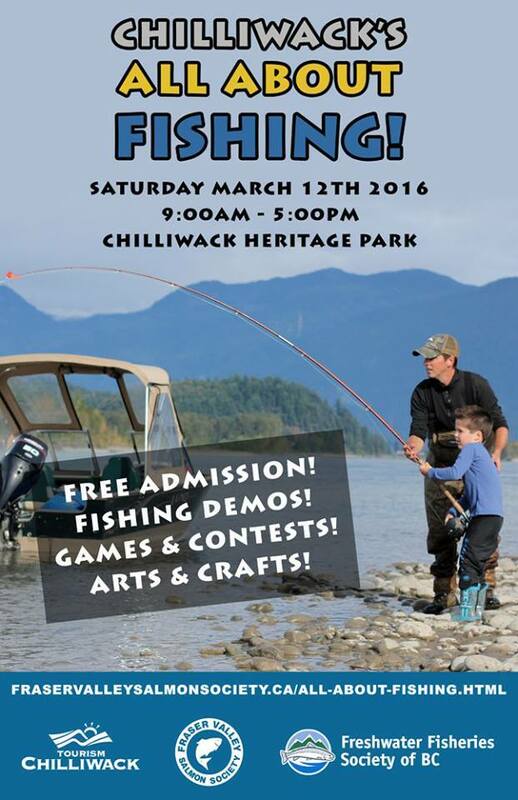 We are involved in the “Chilliwack’s All About Fishing Event” on March 12, 2016 at Heritage Park in Chilliwack – please visit the event page at http://www.fraservalleysalmonsociety.ca/all-about-fishing.html Main sponsors are Fraser Valley Salmon Society, Fishing with Rod, Tourism Chilliwack and Freshwater Fisheries of BC. 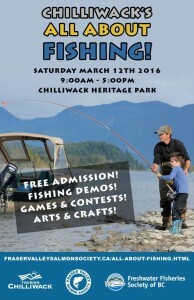 Come learn to fish, all ages from novice to expert, this event will be a show stopper. We also have the “Fraser River Cleanup” on March 19, 2016 at Gill Road – the event is hosted by Woodtone – http://www.woodtone.com/ and the Fraser River Keepers http://www.fraserriverkeeper.ca/ This event is for the entire family and one that is also very dear to our hearts. Setting an example for the future is our company goal each day. Our future generations deserve to have clean waterways, fish and an ability to fish. Education starts each day we wake up and can be taught to all ages. It only takes a little effort to make a difference!